A poetic reminder for me on the eve of International Women’s Day (IWD). 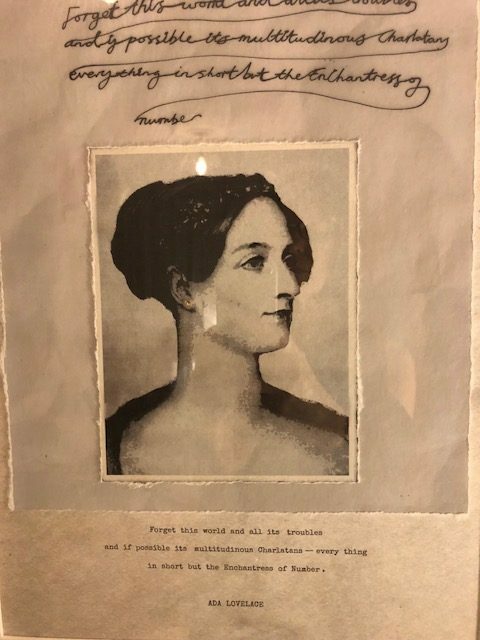 This weekend I spent with friends in Silicon Valley in a house controlled by Google and experiencing driverless cars and contact lenses that predict diabetes .Tonight I just drove through Ockham – home of Ada Lovelace. The illegitimate daughter of Lord Byron – who was “immersed in mathematics” by her mother who did not want her to follow her father’s footsteps. At 12, she conceptualised a flying machine. At 17, she was mentored by Charles Babbage. She added depth to his works and arguably, if he was the “Father” of computing then she was the “Mother”. The machine they invented was a numerical calculator. In 1843 she published a paper predicting the computing revolution and saying that she believed all things could be captured by a code – an algorithm – including music, text and image. How right she was. In the next village, I walked into my hotel bedroom and her portrait is on the wall above the bed. Tomorrow I will speak to a wonderful organisation – arguably one of the most successful in the UK – and I predict soon globally. Started by a woman and which has brought affordable eye care to millions in many ways. My own organisation, PDT Global, founded and run by women now delivers a majority of its work using virtual or digital learning. Ada’s paper predicting the future didn’t get an airing until 1953. But 70 years later and on the eve of IWD, I reflect that without her – maybe it would have all taken longer and that sadly, had she been a man, it may have all happened faster. Whichever, I am grateful for Ada and the countless women pioneers who went before. I hope we do them justice as we work to craft an inclusive world – where everyone with the capability to excel can do so.